NO BATTERY AND NO BLUETOOTH REQUIRED! 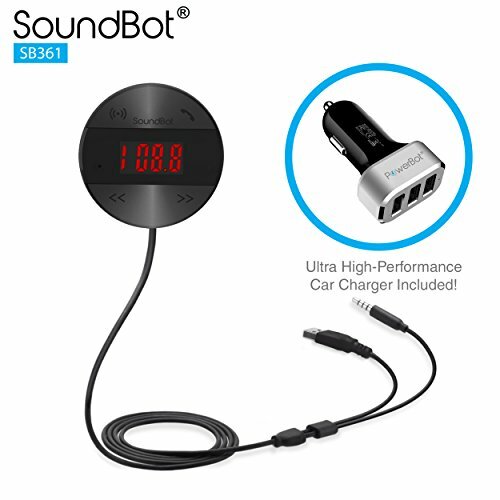 - Receiver adapts universal FM RADIO transmitter technology to reproduce non-stop continuous full spectrum HD acoustic sound, dynamic wireless music streaming experiences and crystal clear hands-free talking from media players or mobile phones to turn car vehicle stereo system into a wireless environment. UNIVERSAL COMPATIBILITY - Standard 3.5mm audio cable for Smartphone, Android, Tablet, iPhone, iPad, Kindle, and other media players without the need of Bluetooth wireless capabilities. LARGE LED DISPLAY w/ 10 PRESET FM RADIO CHANNELS - Featuring large on-board LED display with 10 preset stations to enable operation and change of radio frequencies at ease conveniently and quickly to match with the car FM channel. Equipped with echo and noise reduction technology for improved call clarity and enhanced wireless streaming music listening experiences. INTUITIVE CONTROL & MOBILITY - On board easy access FM station control, multi-function and skip buttons to allow quick navigation. Enhanced call clarity with SoundBot wearable clip mount for flexible mobilization and optimal call quality placement - even for the passenger. Magnetic mounting disc to allow optimal placement and position for the built-in mic to deliver stronger call or signal reception. SMART SIRI & VOICE COMMAND ENABLED - For supported media player model and operating system only, iOS SIRI and Android voice command can be activated. 3 PORT ULTRA-HIGH PERFORMANCE USB CHARGER INCLUDED - Premium 5.1A (2.1A + 2A + 1A) 25.5W car charger included in the bundle to allow simultaneous charge of additional multiple media devices at once.